26 | TH E M R EP O RT FEATURE "Cordray's authority is problematic . . . the director may pick and choose which issues to examine." 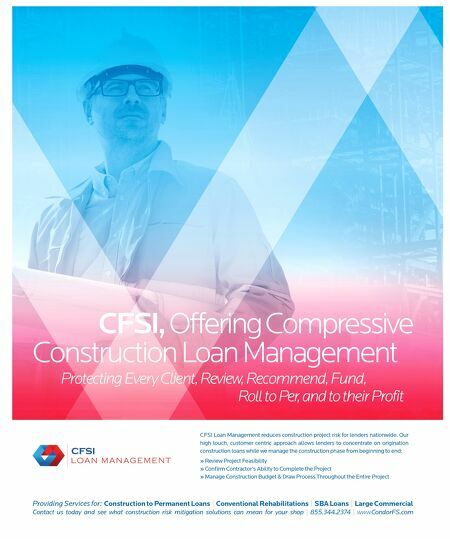 The industry—as well as HUD, various federal courts, and even Elliot—interprets Section 8(c)(2) as permitting payments so long as they are at market prices for actual services performed. For captive reinsurance relationships, the reinsurance must involve a real transfer of risk where the price does not exceed the value. In fact, these arrangements were perfectly legal as outlined by a 1997 HUD Guidance Letter on captive reinsurance. Cordray disagrees. Instead, Cordray views Section 8(c)(2) as merely "to clarify the application of Section 8(a), not as a substan - tive exemption to liability." Under Cordray's interpretation, any dis- cernible connection between refer- rals and payments risks RESPA violation and punishment by the CFPB. Regarding the 1997 HUD Guidance Letter, Cordray simply noted "to the extent that the letter is inconsistent with my textual and structural interpretation of section 8(c)(2), I reject it." Cordray Abandons Statute of Limitations C ordray's decision has completely reworked the timeline for RESPA enforcement moving forward, significantly Disgorgement is a remedy avail- able by courts to force wrong- doers to repay funds, with interest, received through illegal or unethical business transac - tions. Both Elliot and Cordray insist disgorgement is a remedy afforded to the CFPB. Cordray increased the disgorge - ment awarded by Elliot over 18 times its original amount. There are two reasons behind the dis- gorgement increase. First, Cordray believes PHH violated RESPA every time it collected a reinsur- ance premium, not simply each time business was referred under the scheme. PHH was ordered to disgorge all the reinsurance premi - ums it received since July 21, 2008. Second, Cordray did not limit the damages to the amount of profits earned by Atrium; rather, he calculated the penalty based on the gross amount of premi - ums ceded to Atrium altogether. Of course, this number failed to account for any amounts paid out by Atrium on mortgage insur - ance claims. Cordray noted that the concept of disgorgement is centered on ill-gotten gains, not ill-gotten profits. Amid a Blatant Conflict of Interest, the CFPB Faces an Uncertain Future M ore so now than at any oth- er time in its brief history, the CFPB's future is uncertain. The judges of the D.C. Circuit Court repeatedly questioned the structure and powers of the CFPB. Of particular interest to the judges was the concentra - tion of power in a single direc- tor, which neither the President nor Congress has any authority over. One judge especially noted concern over Cordray's ability to unilaterally overturn years of industry practice and custom. 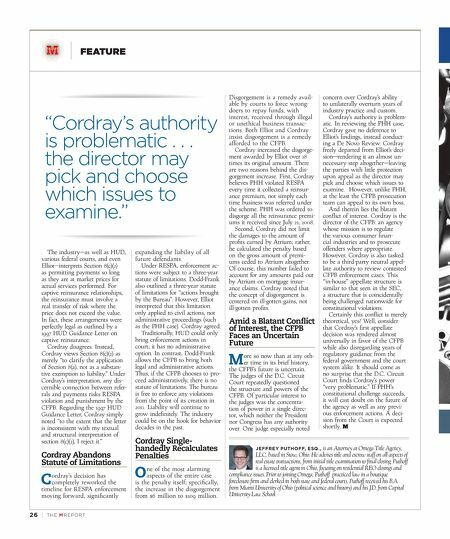 Cordray's authority is problem - atic. In reviewing the PHH case, Cordray gave no deference to Elliot's findings, instead conduct- ing a De Novo Review. Cordray freely departed from Elliot's deci- sion—rendering it an almost un- necessary step altogether—leaving the parties with little protection upon appeal as the director may pick and choose which issues to examine. However, unlike PHH, at the least the CFPB prosecution team can appeal to its own boss. And therein lies the blatant conflict of interest. Cordray is the director of the CFPB: an agency whose mission is to regulate the various consumer finan - cial industries and to prosecute offenders where appropriate. However, Cordray is also tasked to be a third-party neutral appel - late authority to review contested CFPB enforcement cases. This "in-house" appellate structure is similar to that seen in the SEC, a structure that is coincidentally being challenged nationwide for constitutional violations. Certainly this conflict is merely theoretical, yes? Well, consider that Cordray's first appellate decision was rendered almost universally in favor of the CFPB while also disregarding years of regulatory guidance from the federal government and the court system alike. It should come as no surprise that the D.C. Circuit Court finds Cordray's power "very problematic." If PHH's constitutional challenge succeeds, it will cast doubt on the future of the agency as well as any previ - ous enforcement actions. A deci- sion from the Court is expected shortly. JEFFREY PUTHOFF, ESQ., is an Attorney at Omega Title Agency, LLC, based in Stow, Ohio. He advises title and escrow staff on all aspects of real estate transactions, from initial title examination to final closing. Puthoff is a licensed title agent in Ohio, focusing on residential REO closings and compliance issues. Prior to joining Omega, Puthoff practiced law in a boutique foreclosure firm and clerked in both state and federal courts. Puthoff received his B.A. from Miami University of Ohio (political science and history) and his J.D. from Capital University Law School. expanding the liability of all future defendants. Under RESPA, enforcement ac- tions were subject to a three-year statute of limitations. Dodd-Frank also outlined a three-year statute of limitations for "actions brought by the Bureau". However, Elliot interpreted that this limitation only applied to civil actions, not administrative proceedings (such as the PHH case). Cordray agreed. Traditionally, HUD could only bring enforcement actions in court; it has no administrative option. In contrast, Dodd-Frank allows the CFPB to bring both legal and administrative actions. Thus, if the CFPB chooses to pro- ceed administratively, there is no statute of limitations. The bureau is free to enforce any violations from the point of its creation in 2011. Liability will continue to grow indefinitely. The industry could be on the hook for behavior decades in the past. Cordray Single- handedly Recalculates Penalties O ne of the most alarming aspects of the entire case is the penalty itself; specifically, the increase in the disgorgement from $6 million to $109 million.